How does she do it? 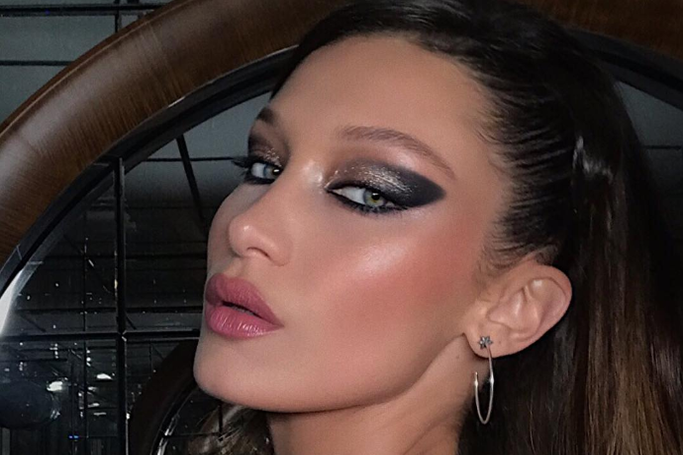 If you want to re-create Bella Hadid’s beauty with the smokiest smoky eye we ever did see, listen up and take note! Bella Hadid set the mood for the Chrome Hearts party during Paris Fashion Week as gothic chic. Dressed in a sheer panelled strapless Alexandre Vauthier black dress with a leopard print handbag and layered chains around her neck, the supermodel exuded dark romance in a look we’re already noting for Halloween. But, the most dramatic element to Bella’s party look was definitely her smoky eye created by makeup artist Hung Vanngo. The bold shadow and thick black liner were highlighted with a metallic shimmer that set Paris alight –as we uncover how to create the daring smoky eye. Apply your eye makeup first, it could get messy so you need to be able to wipe away the smoke and shadow before applying concealer and foundation etc. Swipe a silver shade from the inner corner to the middle of the eyelid. Use a smoky grey and one other similar shade to blend and define. Use a sponge applicator tool (that comes in most palettes) to create a rounded smoky eye effect. Do this by applying plenty of eyeshadow onto the sponge tip, before pressing it where you want the wing of the shadow to fall. Repeat until you build the intensity desired. Ditch the sponge and blend the eyeshadow to connect the look together. Use a dense powder brush for the lower lash line.